What if you could wear a sweater, watchband, or other item made from material that’s capable of generating energy as you wear it? While that capability is still just a concept, the underlying technology may have already been created. Scientists have developed an experimental type of yarn that generates electricity when pulled, which may allow for new means of producing power, and even perform lifesaving sensory functions. 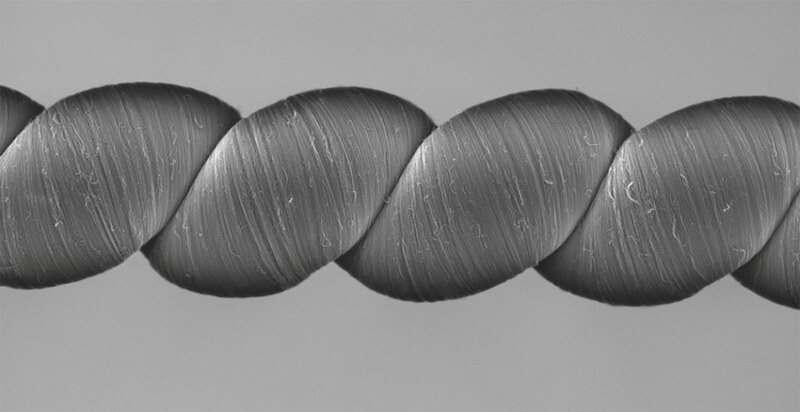 “Twisteron” yarn is made from carbon nanotubes and electrolyte gel. The material was created at the University of Texas, with collaboration from an international team of researchers at Hanyang University in South Korea. While its physical components makes it less than ideal for conventional yarn uses such as clothing, it could be used to generate electricity when submerged in ocean water and stretched by the motion of waves. The material is also capable of harvesting thermal energy that is otherwise lost in an environment. As the material is passively heated and cooled by natural thermal changes, the resulting expansion and contraction of the twisteron yarn has been shown to generate a small amount of electrical energy. This expansion and contraction action can also be used to monitor and power a small respiration sensor. The research team incorporated the yarn into the fabric of a conventional shirt. It then harvested energy from the body’s respiratory motion, which could be used to provide feedback on breathing activity without the use of any batteries. In addition to harvesting electric energy from previous untapped natural forces, the twisteron yarn offers potential value in applications where changing batteries would be impracticable, including a range of interconnected devices like those used and proposed for the Internet of Things. The researchers have also demonstrated that performance and the energy harvesting potential of the yarn could be enhanced by increasing the diameter of an individual strand or by incorporating multiple strands into a single system. Right now, the major hinderance to this technology is its expense. If it were able to be produced at a lower price, the energy harvesting potential would be substantial. Will it someday become a game-changer for production of electricity? Comment and tell us what you think of this development.